The Los Angeles Chargers finished the 2017 season with a record of 9-7, which was good enough to place them second in the AFC West, but just missing the playoffs. This year, they are looking to add to that strong 2017 campaign and win a division in which there appears to be no clear front-runner. While this team may have been relatively quiet during their free agency period, they still managed to nab a game-changer in the 2018 NFL Draft in Derwin James and while most of the attention on the Chargers surrounds Joey Bosa and their defensive front, that attention should be focused on this team’s secondary. The first thing that needs to be established is this Chargers secondary has the potential to be one of the most dominant secondaries in the NFL. The cornerbacks alone are enough to give opposing quarterbacks nightmares, featuring players like Casey Hayward, Desmond King and Jason Verrett. Hayward enters the season as our No. 1 cornerback in the league finishing with an overall grade of 96.4. King was another shutdown corner for this team a year ago, as last season he graded out at 86.5, which made him the 13th best cornerback in the league. If Verrett can come back from his injury and regain his previous 2015 form when he was one of the league’s best up-and-coming defensive backs, this group is going to behard for opposing quarterbacks to pass on. On the backend, a season ago, LA safet Jahleel Addae added a quality player for this team as last year he received a grade of 83.4 and only allowed one touchdown in primary coverage the entire season. The Chargers drafted James with their first-round pick this past April. Despite the praise that James received coming out of Florida State, he still dropped to 17th pick in the draft, which was much further than we at PFF believed he would fall as we graded him as the fifth best overall player in this years draft. James had a tremendous three-year career at Florida State. The former Seminole received a 90.6 grade in coverage last year as opposing quarterbacks fielded a passer rating of just 48.1 when targeting him. However, James showed not only an ability to be a quality safety in coverage, but also had a great feel for other facets of the game, including run defense and when tasked with pass-rushing. His versatility, combined with the fact that his large frame of 6-foot-3 gives him the size to guard big receivers and tight ends, only highlights why he was our top-graded safety in all of college football during his freshman and junior seasons. 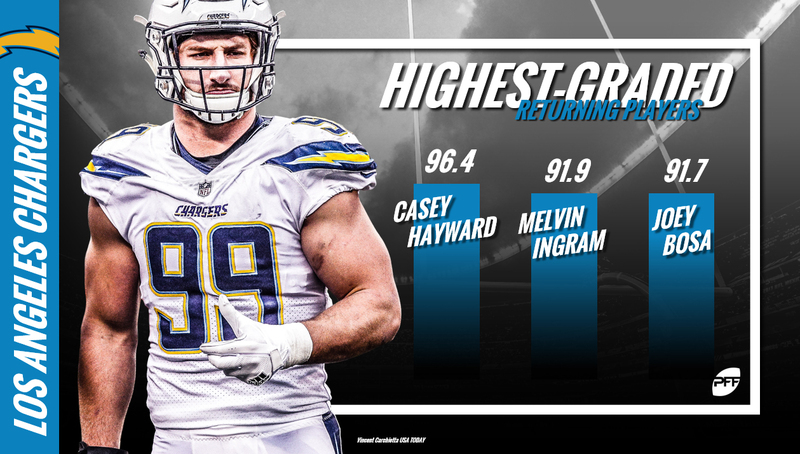 The aforementioned defensive front with Bosa and Melvin Ingram in Los Angeles is also one of the league’s most formidable, checking in at No. 3 in our pass-rush rankings to start the season. They were the only team in the NFL to feature two edge defenders who finished the 2017 season with an elite (90.0-plus) PFF grade, and there’s no reason to expect them to slow down much in 2018. The bonus in 2017 was Corey Liuget producing the best year of his career, adding 26 total pressures from the defensive interior. While this Chargers team possesses a lot of talent on both sides of the ball, the most interesting group to pay attention to during training camp will be the defensive backs. This unit was already among the league’s top units last season, but if Verrett gets back to his former self and if James proves to be the player that everyone thinks he is capable of being, opposing teams will have to find a way to win games without their receivers because passing won’t be an option when facing this defense.